The quote holds a double meaning. For the duration of Ant-Man, Hope had been begging her father to let her suit up and help take down Darren Cross (Corey Stoll), mainly because she believed she was better equipped than the petty thief Scott Lang (Paul Rudd). But with Lilly dropping the "About damn time," it’s also a reference to the lack of an emphasis – unfairly or not – that Marvel Studios has been giving to lead female superheroes. And the news that has hit the wire since Ant-Man opened is that Hope will be an equal partner alongside Scott in the Ant-Man sequel, as the second movie will now be called Ant-Man and The Wasp. And in that movie, Hope’s suit will look a little something like this. All of a sudden, Scott Lang is a major part of the Marvel Cinematic Universe. As we have learned, the inches-sized hero will have a part in Captain America: Civil War, pulled in to Steve Rogers’ latest mission by The Falcon (Anthony Mackie) – who met, and fought, Scott in the Ant-Man movie. But Marvel, reacting slightly to the success of Ant-Man, rearranged its release schedule to make sure that Ant-Man and The Wasp happened sooner rather than later. Peyton Reed has been saying in the media that he’s negotiating to return for the sequel. 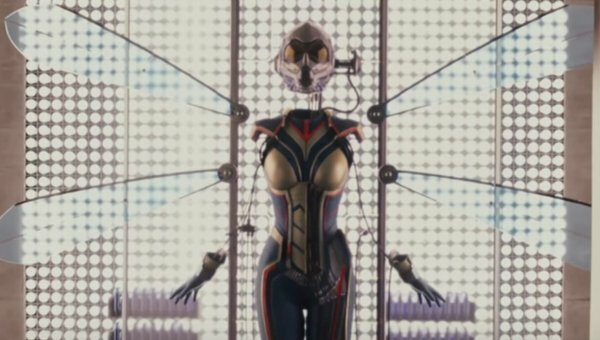 Will Wasp’s costume look like this? Will she already get an upgrade? It seems like everyone’s costume changes from film to film, but we haven’t yet seen Evangeline Lilly IN the suit. Soon enough.